This citrus fruit is found in China, India, and Japan. The fruit is more sweet than sour, and can be candied, distilled, or used in place of lemon zest in most recipes. This south Asian fruit is spiky on the inside, soft and custardy on the inside, and infamous for it’s terrible smell (it’s banned on in many public places in Singapore). Common across South America, the Star Apple is almost too pretty to eat. It typically has a a sweet, milky white pulp and its seeds make a starlike pattern in the fruit’s centre. Also known as Dragon’s Eye, this small juicy is often eaten in China, and is a common ingredient in meals. Another south-east Asian treat, the Mangosteen is a favourite fresh dessert originating from Malaysia and found in surrounding areas. The flesh is often canned, though fresh is always preferred. Palmyra Fruit, or Nungu is commonly available in India, south-east Asia, and Malaysia during the summer. The fruit is often pickled, and is known for the small white kernels inside which are make soft, jelly-like snacks when the fruit is still young. 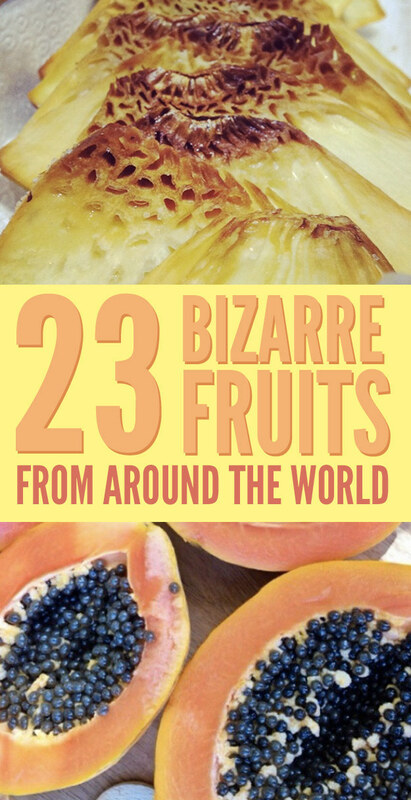 This South American fruit is beloved in Peru and Costa Rica. It’s commonly eaten raw, or used in desserts. While it’s hard to find abroad, lucema powder is used internationally as a supplement and sweetener. These tasty fruits are popular in the Phillipines, and can be eaten on their own or cooked into a savory dish for a unique flavour. The soft flesh of the rambutan is protected by the colourful and spiky exterior. The fruit is as common as the apple in countries like Malaysia, Vietnam, and Borneo. The largest known treebourne fruit, jackfruit is commonly found in south-east Asia. It has a fleshy, fibrous pulp and can be eaten fresh, added to desserts, or seasoned for savoury meals. These Taiwanese fruits are spongey and crisp, and should be eaten fresh, or can be distilled into liquor. The tamarind is native to Africa, but widely used in many countries. The sour fruits are common ingredients a wide arrray of Indian and Asian dishes, and Tamarind-ade is commonly drunk in some South American countries. Known as sweetsop in the Bahamas and Jamaica and by many names across South America and south-east Asia, the sugar apple can be broken open and eaten fresh, or strained and added to ice cream and other desserts. The lulo, or naranjilla looks like an orange on the outside and a green tomato on the inside, and is incredibly popular in Colombia and Ecuador. The jamun is commonly used in desserts in India, and can also be eaten with salt. Common in Jamaica, ackee can be eaten fresh if well-ripened, and is most often used in entrees, like the popular Caribbean dish, Ackee and Saltfish. This large Pacific Island fruit can be sliced and eaten fresh, or wedges can be fried and served a side at meals. Variations of the jujube are found in India, China, and across Asia. The fruits are most commonly eaten ripe and raw, but can also be stewed. Known as egg fruit in English, the South American canistel has a a sweet and creamy flesh, and is a common ingredient in milkshakes, ice cream, and custard. Rowan berries are commonly found in the UK and across the northern hemisphere, and are often used in a jelly served with meat dishes. This large fruit grows in midwest America and tastes of melons and bananas combined. The sweet, pineapple-shaped puhala fruit is common in Hawaii.